Imposing a school uniform to students may accentuate some problems. When schools decide to impose a school uniform on their students, they usually do it after careful consideration, weighing the pros and cons of such a drastic decision. While uniforms may indeed help solve the problems of inappropriate student attire and lower school crime, experts have also noticed some downsides to such measure. School uniforms may actually be more expensive in the long run. 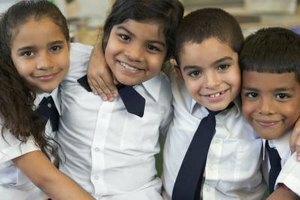 While buying a uniform instead of expensive branded clothes may seem like an economical solution to parents, it may sometimes actually be even more expensive, according to the Public School's Parent's Network. While students who are free to wear casual clothes at school usually use the same outfit for an entire day, students who are enrolled in a school that imposes a uniform tend to wear two outfits: a uniform during school hours and a casual one after school, forcing parents to spend even more money on clothes. Uniforms do not allow students to express themselves through their personal experience. Students who are allowed to wear casual clothes at school usually express their personalities through their choice of clothing. This is especially true for older students. On the other hand, uniforms, by definition, do not allow students to express themselves through their personal appearance. According to Dr. Alan Hilfer, child psychologist at Maimonides Medical Center in Brooklyn, this may lead to situations in which teenage students start resenting uniforms, undermining the whole purpose of the measure. Uniforms may be a source of discomfort. All children are different, especially when it comes to their morphology. When choosing casual clothes for their children, parents are usually aware of their morphology and purchase appropriate items. Children also tend to wear more frequently clothes in which they feel comfortable. Uniforms do not allow this, and force all children, whatever their body type, to wear the same clothes for the better part of a week. Experts think that this may cause potential discomfort to your child. A uniform policy doesn't have any positive influence on discipline. John Grossman has worked as a journalist and copy editor for various publications since 1985. In the 1980s, he was in charge of the entertainment section of the "Austin Chronicle" newspaper and has, since then, worked for other publications, including golf and fitness magazines. Grossman holds a Master of Journalism from the University of Texas. What Color Do Hindus Wear to Funerals? What Are the Benefits of Girls in Single Gender Classrooms? Grossman, John. "Expert Opinion on the Negative Effects of School Uniforms." Synonym, https://classroom.synonym.com/expert-negative-effects-school-uniforms-8043408.html. Accessed 24 April 2019.